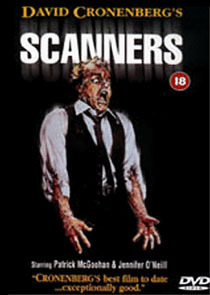 Many independent companies stepped forward to seize a slice of the blossoming DVD market, and often their product was very shoddy indeed, like these first four releases from Arrow Films. Obviously the fact that the DVD format is all about optimising the home entertainment experience has completely passed the company by. 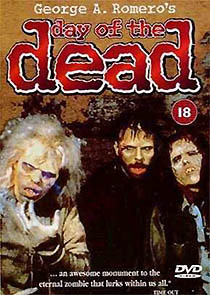 These discs, all desirable titles, are all presented full-frame and in mono, from ancient video transfers that probably date back to the early 1980s. The Brood, particularly, is quite horrible, with obvious signs of wear and tear. The discs do have chaptering, accessed through a very primitive menu screen, but there’s not even a printed list inside to help armchair viewers. The cheap and nastiness of these releases might just be forgivable if they were very cheap (say £5.99), but they’re not: they’re as expensive as the latest cinema blockbusters packed with extras. Avoid. Two of these discs have been repackaged. The Brimstone and Treacle disc now carries the Prism logo. Same transfer, same lousy disc. Arrow reissued Day of the Dead with a new letterboxed transfer (sadly still not with anamorphic enhancement) that's a marked improvement. A comparison with the old disc reveals that the new image is matted, as no new picture information has been added at the sides, but the compositions are much stronger, and are obviously as intended. The new transfer has much more accurate hues, too, and eliminates most of the momentary glitches that continually bugged the old disc. 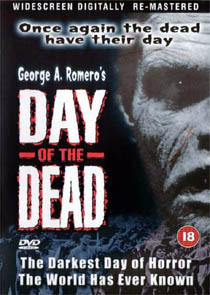 The new disc comes with a bunch of supplementary material, principally a coarse-looking twenty-minute featurette, Behind the Scenes With Day of the Dead (including footage of Tom Savini at work). A theatrical trailer for each film in the trilogy and a modest photo’ gallery are also offered.